It's been an absolutely insane summer, we couldn’t have asked for a greater launch! The management team appreciates everyone who has given us a shot and stuck around since beta release. Conrad and I shaped what we thought the perfect survival experience would be, and we sure have succeeded for the most part! Of course, it wasn’t a smooth road to get there; we are far from perfect and have had our fair number of challenges. There's only more to come for Venture Ville, and one day we hope to topple the charts. 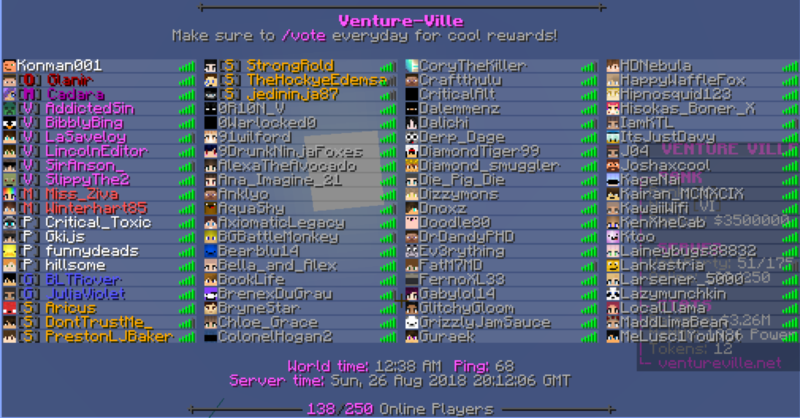 We managed to hit 138 concurrent players today and we couldn’t be more thrilled! With school starting up again we wish everyone a great year and hope to help you through the grind! We’re adding a wiki! A wiki is typically a page that is editable by anyone. However, Venture-Ville’s wiki can only be edited by staff members. Don’t worry though, a forum will be available to submit any changes you wish to be made to our wiki. What can I find in the Wiki? Well, what are you waiting for? View our wiki HERE! The dungeon update is something we’ve been working closely on. Venture through a custom map, fight mobs and receive unique rewards used for Township Upgrades. Find out more about our upcoming dungeon update HERE! I am really glad to see there will be a wiki for commands and such. There’s a lot to navigate as a new player. While I’d love to stick around, I also don’t like asking a million questions a day.